I picked up this book a while ago from a sales table at a local bookshop. The cowboy on the front drew me in and when I read that it was set in Wyoming I nabbed it. It's the best couple of dollars I've spent in a long while. Colton puts his hand up in class one day. "Yes, Colton?" says his teacher. "You have a question?" "No ma'am," says Colton. "It's more of a suggestion." "Well, ma'am, I was just wondering if you could talk twice as fast and then we'll get 'er done twice as quick and then we can get out of here in half the time." An optimist with a forgiving nature, his mantra is: "Mind over matter. I don't mind, so it don't matter." And that sees him through his teens and into his twenties. By the time he is 25 he has a wife and two sons and is working long shifts at an oil rig in Upper Green River Valley. But tragedy is just around the corner. 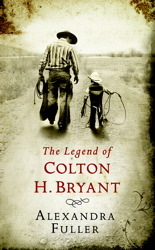 In a story that evokes both laughter and tears, Alexandra Fuller's powerful prose delivers the heart and soul of Colton H Bryant. And as you turn the last page you know that he is indeed a legend. Sounds like a great read Sue! It sounds great. I can really sense the true coyboy thoughts and expressions just from that little taste you gave us. Thanks for the review.